Now that Mimi Capurro and Charles Parks are co-owners of Gotcha Detective Agency, and Mimi is single again, all should be going well, especially since they just landed a cushy new contract with the local police department. The prostitution decoy sting operation is in full swing and has the stamp of approval from the chief of police. Mimi can't help but be impressed with how her employees look, in fishnet stocking and pushup bras. And everything is going great until one of the decoys disappears from the sting operation. 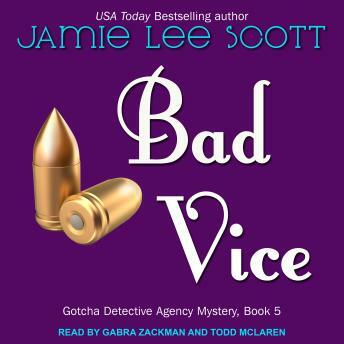 Now the Gotcha detectives must find the woman, and find out who would want her to disappear, possibly for good, before the police department vice squad realizes she's gone. This case will try the nerves of the Gotcha detectives, and bring Nick back into Mimi's life. Is it possible for them to work together, and just be friends?